When it comes to making the most of your motor bike, there are certain things you can do to make it more to your liking. 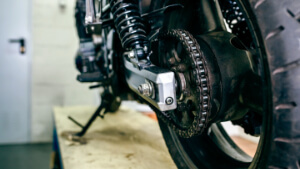 In most bikes, the suspension can be adjusted to offer a smoother ride, but you need to know how to do it without causing more damage to your vehicle. Let's take a look at how to adjust suspension the right way. Many people don't even know what the suspension system does in their bike. The suspension system in any vehicle, whether bike, ATV, or car, is there to serve the purpose of creating a smoother ride, protecting the vehicle from impacts or vibrations, and giving the vehicle a better control and handling. The main reason to adjust your suspension on a bike is because the suspension system is set up in the factory to do its job without the weight of the rider on it. When you sit on the bike, it changes the way the suspension reacts based on your individual body weight. By adjusting the suspension based on you sitting on it, you can get a smoother ride customized to your needs. It is important to note that when you adjust the suspension based on your body weight, you also want to make sure you don't compromise on the bike's ability to handle sudden braking or sudden changes of direction. When it comes to how to adjust suspension, it's a lot easier than you might think and pretty much anyone can do it. You will need two people for this task so grab a buddy before you get started. The first step is to set your sag. You want to put the bike up on a center stand so you can see how much of a gap is naturally there when no pressure is applied. You should measure from the swing arm near the spindle to a point on the mud gear of the rear. Measure this space with a tape measure and make a note of it with a piece of tape so you keep things lined up correctly later on. From there, the sag will need to be set based on how much weight you are bringing to the bike so now is the time to put on the usual gear, including boots and helmets, you usually wear while riding, take the bike off the stand, and sit on the bike. You want to have someone with a tape measurer measure between the same two points as earlier. When you subtract the second measurement from the first, you will get the suggested sag based on your body weight when on the bike. The general rule of thumb is that this number should be around 100mm, but you want to check your manual to be sure this is acceptable. You want the wheels to be able to go over any bumps without hitting the tops of the suspension too hard while still adjusting for your weight for a smoother ride. If you need to adjust the sag on the bike, you should refer to your owner's manual since some bikes are different. In general, most bikes can be adjusted by way of the preload of the shock spring. If the sag is too much than you need, you can tighten the preload adjuster which will compress the spring by using either a specialized tool or a bar of drift and a hammer. If the sag is less than what you need, simply slacken off the spring pre-load. The key is to be gentle either way and do smooth, continuous movements, rather than sudden jerks when doing this action. After you have the right sag based on your weight needs, you can check the quality of the ride. Sometimes adjusting the sag is enough to make the ride a bit smoother. If this doesn't do the trick, the next step is to set the ride quality. You can set ride quality by adjusting the front and rear compression dampening adjusters one click at a time. If you have never adjusted these on your bike, you are probably still riding with the factory standard setting which would explain why the ride is bumpier than usual. Adjust this one click at a time and take it for a ride until you find the compression setting that works for you. In addition to the compression, you can also try to lighten up the rebound. This is similar to the compression in that you can adjust it by a click at a time until you find the best setting for your riding preferences. The goal of adjusting compression and rebound is to find the setting that works for your sag setting while giving you a gentler ride over bumps without losing any of the bounce you expect from the suspension system. You may need to play around with these two settings a few rides to find the right balance for your needs.